Based on the best-selling 17-volume Life Application Commentary series, this single, handy volume holds practical, concise insight on every verse in the New Testament. Now Pastors, Bible teachers, and students can get all the useful background information they need, without a lot of obscure facts they don't need. An easy-to-use resource offering clarity of understanding and how the Bible applies to real life. 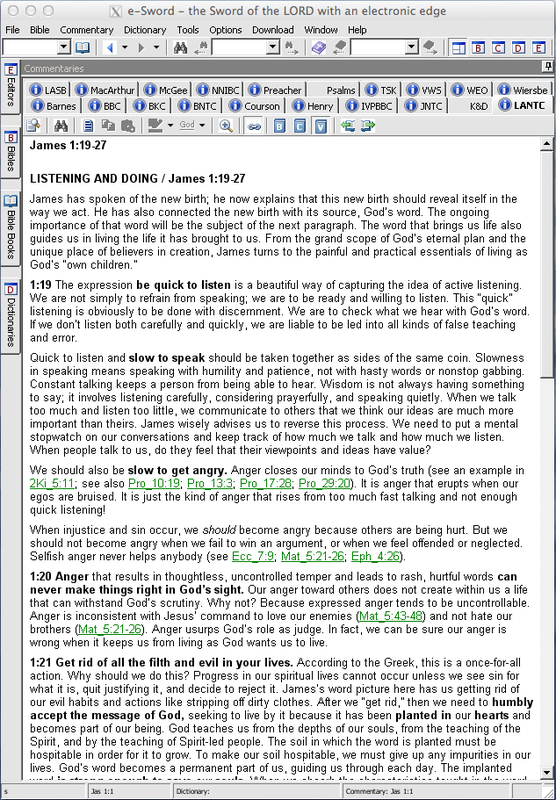 The Life Application NT Commentary is unique among commentaries, first because it is so readable. Each entry is clear, easy to understand, and full of life-relevant information. You will find practical insights for your life and to and share with others, and profound truths that reveal the dynamic power of God's Word in people's lives today. Most importantly, the Life Application NT Commentary emphasizes "application." Application begins by knowing the facts—understanding the timeless truths of God's Word—and understanding the Bible's relevance. But application is more than that. Application focuses on the truth of God's Word, shows us what to do about what is being read, and motivates us to respond to what God is teaching. It is the biblical "how to" of life and it is where the Life Application NT Commentary excels. Here's the commentary every Bible student will want and turn to again and again. And it's a terrific value - Over 1,295 pages in print! Book Introductions discuss the author, date, setting, audience and the main themes of each book with their importance for today. The author's insights are a valuable addition. While many comments are the same as other authors, this reinforces the authenticity of the comment and at times this author's insights add to the commonly accepted. Highly recommended. Great resource and find addition to e-Sword. I'd like to see additional translations become available here. Very helpful giving new areas of thought to help try and give an all round appreciation. There are many resources available for those who are disciples of The Lord Jesus Christ. However, Esword is my favorite to to resource for studying God's Word. Use Esword everyday, thank you Brother Rick Meyers for all of all of your hard work and faithfulness. Excellent commentary. Very user friendly and easy to use. Like all the features. This is a great source of insight into the meaning of the scriptures and it relevance for today. Often brings out thoughts that might otherwise be obscured to the casual reader. Excellent resource. Very helpful with great insights for preparing messages and studies. Recommended. Great asset for personal study, teaching or sermon preparation. Well worth the investment. This is a must have for pastors in their library. It has been such a help in preparing sermons and Bible studies. I actually have the entire set of commentaries in my library but when I saw that it was available on E-Sword as well, I had to buy it. a most helpful Biblical aid at hand. The commentary is "fresh" and opens up a new perspective on subjects. Find it very helpful during sermon preparation as well as during Bible-readings, specially when quick reference is required on a topic. I find the Life Application New Testament Commentary to be both practical and helpful! The section overview followed by the verse-by-verse commentary gives valuable insight without being too technical or cumbersome. Helpful, easy-to-access links to complimentary verses are contained within the commentary. I believe both preachers and laypeople alike will benefit from the gems and nuggets contained in the Life Application New Testament Commentary. I recommend it! It is easy to use, helpful for my gospel presentation. Thank you so much. very practical and comprehensive. easy to read and understanding. very good. Excellent help for teaching and preaching. After a few hours of use I did not want to miss this comments anymore. E-Sword and the add-ons are continually getting better with every release! I look foreward to them. For quiet time reading I still love the feel of turning the pages of my bible. For serious study time there is nothing even close to e-Sword. Now with The Life Application New Testament Commentary my study time is so much more productive. Easy to understand every day english really brings all of the verses and chapters to life which strengthens my relationship with my Lord. Thank you for such a great tool. I recently purchased the Life Application New Testament Commentary because I was somewhat familiar with the Life Application Bible. Upon opening the commentary, I was very pleasantly surprised at all the information included, not only for the Bible verse selected, but also for the chapter and surrounding verses. The other commentaries are great, but sometimes use an older form of English and may be more difficult to express in a 'teaching' setting. The LANTC, however, uses today's vernacular and is extremely clear in understanding. I love my e-Sword program. I have used other Bible programs, but Rick Meyers has developed the best tool for Bible study available. The recent up-grade which includes audio sermons for many of the verses is too wonderful! The best feature of e-Sword is it's ease to use. I just briefly glanced at the training video and was proficient in no time. Also, should you ever have a question, the technical support responds within 24 hours. What a wonderful addition to e-Sword. I was already familiar with the hard copy and was elated to see it available on e-Sword. I believe it to be very reliable and understandable commentary. A great study tool. It is amazing to me that all the Bible study tools you offer are so reasonable and easy to download. What an incredible ministry. Praise the Lord for your diligence in continuing to provide the tools to make our Lord and Savior known to all who hunger and thirst for the Word. l love this book very much. It goes into the depth of the New Testament. It gave me a lot of information to study the N.T. and to understand some verses better and better. This Life Application N.T.Comm. is very precious as Gods Word comes more alive thanks to the commentators who, surely are inspired also by Gods Holy Spirit. This commentary is thorough and fascinating. It provides pertinent background and thoughtful insight which translates into inspirational preaching and teaching. I highly recommend it. A great modern verse by verse commentary... don't have to read lots before you find your verse! I like the Book intro's too, balanced &amp; up to date scholarship that's relevant to today's lifestyles but unwavering with the truth. Well worth the money. These life applications help you to apply life and faith. I downloaded this module yesterday, and had a very good look at it. I went through some of the Scriptures with it in areas that I am currently studying, and found the entries to be quite enlightening. The aspect I liked is that its "jargon" free. The language used is easy to read and understand, and so it makes it one of the best and practical commentaries I read.